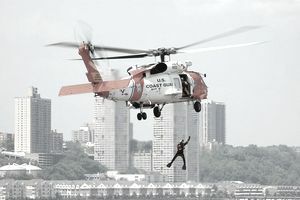 The Coast Guard's rescue swimmer training school has one of the highest student attrition rates of any special operations school in the military. Roughly 75 to 100 students go through 24 weeks of Coast Guard Rescue Swimmer school in Elizabeth City, North Carolina, and just over half of them complete the course successfully. Some years, the dropout rate for this program has been as high as 80 percent. And this is from a pool of candidates of Coast Guard personnel who are conditioned to be able to swim well. It's definitely not a job for the faint of heart. Rescue swimmers must have flexibility, strength, endurance, and be able to function for 30 minutes in heavy seas. This is obviously far and above the normal lifeguard course; you're not just treading water, you're expected to be able to hold your breath, and perform challenging tasks. Rescue swimmers need to be able to provide basic life support for whoever they may be rescuing, of course, and their training will include emergency medical training (EMT) course. But it's not the standard EMT training; it's for rescues to be conducted in the open seas under extreme conditions. The required monthly physical training fitness regimen includes a 12-minute crawl swim of 500 yards or longer, a 25-yard underwater swim and a 200-yard buddy tow. Those are in addition to performing push-ups, sit-ups, pull-ups, chin-ups, just like other military fitness tests. The 137-page operations manual includes lessons in eight different water deployment procedures, 11 ways to approach, carry and release a survivor, seven ways to release equipment for Navy and Air Force flyers and ways to detangle the services' different parachutes and backpacks. Adding even more pressure during training, instructors treat candidates with a drill sergeant style. But this is perhaps the most crucial part of the training; if these candidates can't endure extreme conditions, it's going to be hard to rescue someone in distress. Candidates selected for the school must first go through what is called the airmen training course. The four-month-long course, which, despite its name, has nothing to do with the Air Force, helps prepare candidates for the grueling rescue swimmer course. The first six weeks of the four-month course is loaded with rescue swimmer training. While they are going through the swimming and classroom phase of their training, candidates also must attend classes to learn about the aircraft they will serve on. Finally, before graduating, candidates are required to pass a test involving multiple rescue scenarios.